Pain and sacrifice aren’t experiences we often think of as good. You probably haven’t heard someone say, “it was such a great experience, there was pain and sacrifice the whole time, it was awesome.” A few things have recently reminded me that pain and sacrifice are critical ingredients to just about anything that is worthwhile in life. Last week I competed in the Spartan Beast in Monterey. The website describes the event as “12+ miles and 25+ obstacles – An obstacle Race from Hell” but I can assure you it was worse. I willingly signed up for something that would involve several hours of pain and discomfort as well as risk physical injury. More significant than the few hours of competition were the many hours for training and preparation. This meant I had to sacrifice time with my family while I prepared for the grueling event. What do you get after beating yourself up mentally and physically at the Spartan Beast? You get one cold beer and a medal. More importantly, you get a tremendous sense of accomplishment and pride knowing you can take on the challenge and do something you once thought impossible. 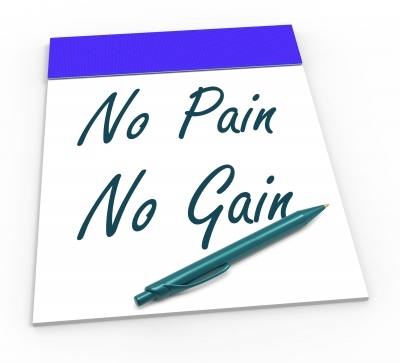 When it comes to pain and sacrifice, investing is no different. If you are to be successful, you must embrace the pain and sacrifice that comes with investing. Putting money into a savings or investment plan is sacrifice. You are setting funds aside that could be used for a thousand things other than investing. If you can sacrifice, you will be successful. Going through difficult times in the market and seeing red is painful. If you can endure the pain, you will be successful. Having a large nest egg is only possible for those willing to endure pain and sacrifice. Embrace it. They are not only good things, the are critical ingredients to just about anything worthwhile in life. Do you have questions about personal finance?